Maybe you entered marriage with some pretty high expectations-most couples do. Jonathan and Wynter Pitts did. Until the reality of married life spilled into their expectations. Emptied is a way of life. It's not about trying harder, it's about thinking differently. Only when you are emptied of your own self-focused motivations can God pour new life into you for the abundant marriage and satisfying relationship you long for. Are you ready to approach your marriage poured out, ready to be filled up? 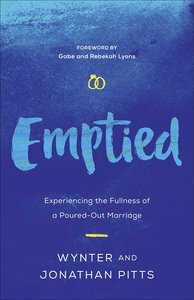 About "Emptied: Experiencing the Fullness of a Poured-Out Marriage"